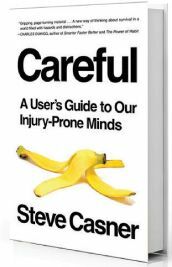 A warning to readers: Direct exposure to Steve Casner’s “informative, funny, and frightening” primer on accidental death and injury may trigger a desire to wrap yourself in bubble wrap, said David Martindale in the Fort Worth Star-Telegram. Casner, a NASA safety expert who’s spent 20 years imagining things that could go wrong for astronauts in space, sees potential for injuries almost everywhere he goes, and he never forgets that as recently as 1992, 1 in 40 Americans died in an accident. What’s more troubling to him, though, is that after a nearly century-long decline, the accidental death rate stalled out in the ’90s—and since 2000 has been ticking back up. “Absurd and humiliating dangers” surround us, and Casner helps us look at daily life the way he looks at a NASA mission, said Joshua Rothman in NewYorker.com. Driving, of course, offers its share of hazards, but playing hermit is no solution: Even power-line workers, we learn, are more prone to accidental death at home than they are on the job. Speculating on why fatal accidents are on the rise, Casner blames a mix of factors, including the distraction of smartphones, the rise of power tool–wielding DIY enthusiasts, and our longer lives—which increase the chances of our making a deadly blunder. There’s also what he calls risk homeostasis—our tendency to respond to increased safety by adding new risks. When we wear bike helmets, we ride closer to traffic. When we take desk jobs, we also take up rock climbing.